Prices 50% Lower Than Average Retail Stores Retail stores charge significantly higher prices for eyeglasses frames and prescription lenses, in order to compensate for vision insurance; if you don't have eyewear insurance, they take a much higher profit on everything they sell. We source the exact same (or better) frames and lenses, but we add a lower profit margin for ourselves. We are an authorized out-of-network provider for all vision insurance plans. Best Designer Eyeglasses Brands, Massive Selection We offer 400 top designer eyeglasses brands, and over 200,000 styles of eyeglass frames. 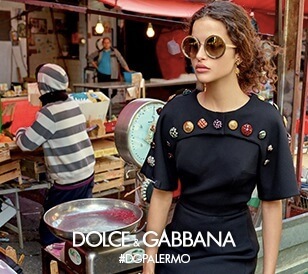 Most retail stores only offer a few designer brands, and no more than 1,500 models to choose from. Highest Quality Lenses. Perfect Lenses Guarantee Our lenses are all made by Essilor, Varilux, and Zeiss, the world leaders in prescription lenses. 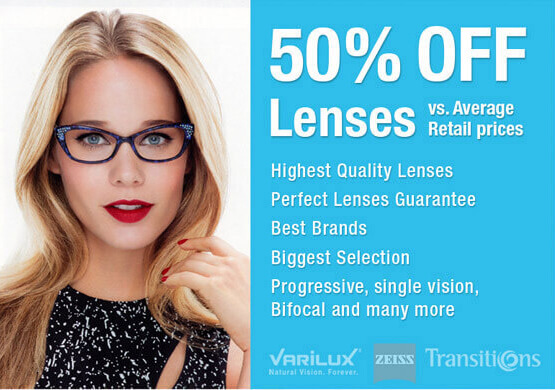 Retail stores either use Essilor lenses, or lower quality and lower cost lens products. Other online stores use the cheapest lenses possible. We guarantee a full refund if you don’t love your lenses. Most stores do not offer a refund. Best Service, Best Quality, and Best Selection among online stores Most online eyewear stores are selling low price, low quality eyeglass frames and lenses. We don’t sell low quality eyewear, and we stand behind everything we sell. Low quality eyeglasses can lead to poor vision, and frequent breakage – we don’t offer these types of eyeglasses products. And if you have a problem with our products, you can call us. Try calling the other guys to get help! Replacement Lenses Service When your prescription changes, most retail stores will try to sell you another frame and lenses. But you can mail those eyeglass frames to Eyeglasses.com, and we will replace those lenses, saving you a bundle of money and aggravation. Free Shipping We offer free shipping in the US and to many countries. We offer an easy 30 day full return policy on eyeglass frames. You can even order 4 frames and return 3 for a full refund. Best Consumer Reviews Don't take our word for it: Check out our reviews at the independent rating agencies, Shopper Approved and Trustpilot. Buying eyeglasses online is a great way to get more selection and at a lower price than more optical stores. However, it does require that you educate yourself first. There is a lot of information on this website about eyeglasses and prescription lenses, but this page will help you speed up the process, depending on what you need. You can order eyeglass frames only, without lenses. We ship the frame to you, and you can take it to your local optical store to have lenses installed. Need help choosing a frame, or finding the right size frame? Call or email our customer service department. We do answer the phone! Upload your photo and use our Virtual Try On application. Try our Frame Search page to look through our huge inventory for frames with your specific needs, such as frame size, material, and shape. Still not sure? You can order up to three frames and return them for a full refund. Step 1) Get a Prescription and Pupillary Distance Measurement. To order frames with lenses, start by getting your prescription and your "PD" Pupillary Distance measurement. Most doctors will not measure your PD unless you ask, so be sure to ask for it and write it down on your prescription. If that is not convenient, you can call the store that last made glasses for you, they should have that on file. Follow this link to learn How To Measure Your PD. 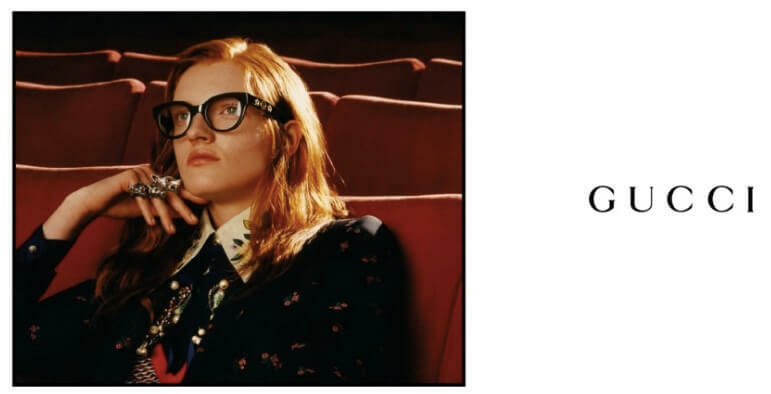 Step 2) Single Vision, Progressive, or Bifocal Lenses? If you want single vision lenses, you can skip this step. If you want multifocal lenses (progressive, bifocal, or trifocal), then you must pay attention to the height of the lens in the frame that you choose. Lens height is known as the "B" measurement, and you can see it in our catalog, on the frame pages. The "B" measurement must be at least 27mm, and we recommend 30mm or more for multifocal lenses. You can use our Frame Search page to search for frames with a minimum B measurement. Step 3) Choose a Frame. Need help choosing a frame, or finding the right size frame? Call or contact customer service - we will answer the phone! Try our Frame Search page to look through our huge inventory for frames with your specific needs, such as frame size, material, and shape . Still not sure? You can order up to three frames and return them for a full refund (read our Return Policy). Once you have chosen a frame, you can add lenses to it by clicking the "add lenses to frame" button on the product detail page. That will take you to the beginning of the Lens Wizard . The Lens Wizard will walk you through the process of finding the perfect lens for your needs. And if you need help or have questions at any time, just call us! When you finish in the Lens Wizard, a lens will appear in your shopping cart, and then you can check out. You can send us your own frames, and we can install new lenses for you - also known as "Replacement Lenses." 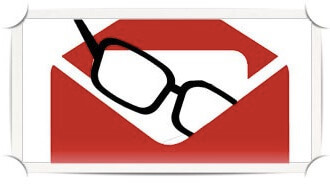 Mail your eyeglasses frames to us with your new prescription, your name and phone number, and any instructions you may have. If you just want to redo your existing lenses, you do not need to send the prescription in because we can read your prescription from your old lenses. After we receive your package, we will call you to complete the order. You can mail us your glasses, and we can install new lenses. However, occasionally a frame will break while we are installing lenses and we cannot be held responsible if this happens to your frame. We will try to replace your frame at no charge; if that is not possible, we will offer you a 50% discount to purchase another frame from our website. You can order sunglasses, and they are shipped with the non-prescription, manufacturer's lenses installed at no charge. Need help choosing a pair of sunglasses, or finding the right size frame? Call or contact customer service - we will answer the phone! Try our Frame Search page to look through our huge inventory for sunglasses with your specific needs, such as frame size, material, and shape . Still not sure? You can order up to three sunglasses and return them for a full refund (read our Return Policy). How do I buy eyeglasses online? 2) Pick out an eyeglass frame. 3) Add frames to your shopping cart, then click "add lenses". This takes you to the Lens Wizard. 4) Open an account and enter your prescription. Or, call customer service and we will upload it for you. 7) Relax. We will double check it. What happens if the lenses and frames I pick out are not compatible? When you place your order, it is reviewed by our customer service team. If we have any questions or see any problems or incompatibility in your order, you will be contacted within one business day of receiving your order. If everything looks good, we will not contact you until we ship your eyeglasses, at which point we will send you an email with a tracking number, and we will charge your credit card at that time. Is there someone on your site who will advise new customers on the best selection for their needs? Yes. In fact, we urge you to call customer service with any questions. We can help you find the best frames and lenses for your unique circumstances. How do I get the right frame size for my face? We have written a whole article on this topic (Link: eyeglasses size). In short, use your current eyeglasses as a guide to find similar-sized new eyeglasses. How are the eyeglasses adjusted for a customer's use? We have written a whole article on this topic too (Link: Adjusting eyeglasses). In short, if an adjustment is needed, you can learn to do it yourself, or take it to a local optical shop and pay them a small fee to adjust the glasses. By phone, fax, email, upload to website, letter, telegram, telex, or carrier pigeon...whatever is easiest for you. We recommend the Upload Rx To Website method: at checkout, you will be able to upload a photo of your prescription. Or, you can call customer service and we will help you. Fitting eyeglass frames begins with "Do you like the way the eyeglasses look on your face?" If you like the way the eyeglasses look on your face, and the frames are comfortable, then you don't need to do anything else. If the eyeglass frames are not comfortable or are slightly crooked, an optical professional can make minor adjustments to the bridge, nosepads, and temples to customize the eyewear to the uniqueness of your face. If you have a stronger prescription, we strongly recommend that you have your eyeglasses fitted by an eyecare professional. We recommend that you visit a qualified eyecare professional to have your frames fitted properly. A proper fitting by an eyecare professional is important to ensuring the comfort of your eyewear. An optician begins by aligning and "truing" eyeglass frames, so that they are even from every angle, with the frame front slightly curved (face form) and the bottom of the frame closer to the face than the top (pantoscopic tilt). Brand new glasses are almost always aligned and trued at the factory. In the rare case in which new frames are out of alignment, the optician bends the frame into proper alignment using a combination of hands, pliers, and heating equipment (for plastic frames). The next step in the fitting process involves adjusting a "true" pair of frames for the unique characteristics of your face. Eyeglasses fit properly when they feel comfortable to the wearer, and the lenses are equidistant from the face. Once this position has been established, the optician checks to be certain the lenses are positioned in the correct spot in front of your pupil. The characteristics of your prescription determine the special details that need to be adjusted by a qualified eyecare specialist. Multifocal lenses (progressive, bifocal, or trifocal) all have a line that divides the distance vision lens from the near vision lens. The line may be visible in the case of a bifocal, or invisible in the case of a progressive lens. An optician can determine the correct position for this line, by marking on the demo lenses the "seg" height -- the height from the bottom of the lens up to the correct position for the line. In order to determine the correct "seg" height, the optician can fit and adjust the eyeglass frames on the wearer's face. The "seg" height will be different for every pair of glasses, and can only be determined after the eyeglasses have been fit to your face by an optical professional. As a result, the seg height must be measured again for every pair of glasses. If you send us a frame with multifocal lenses in it already, we can copy the "seg" height from those lenses and make new lenses for that frame with our Replacement Lens service. You could also ask your local optician to mark your "seg" height on the demo lenses of your frame, and then send it to us. With the "seg" height marked, we will be able to make multifocal lenses for you. Or, you can follow these instructions, and we can determine your Segment Height Measurement. For any person, there is no one right size of glasses. Your face can accommodate a wide variety of glasses sizes and most glasses will work for most people. In order to understand why this is true, you need to look at what size means; size in glasses is a very different concept than size in shoes or clothing. As a result, you should focus most on how the glasses look on your face; when you find glasses that look good, in most cases the glasses can be adjusted to fit your face. The rule of thumb is that the total width of the glasses front all the way across, including the endpieces, should be similar to the width of your head. This will allow for the optimum proportion of the glasses to the head, and for the best comfort. There are two ways to measure eyeglasses frame size: 1) Read the tiny lettering on the inside of your glasses. Sometimes the lettering has worn off, or it is too small for you to see even with a magnifying glass. In which case you need to 2) Measure your glasses with a millimeter ruler. The eye size is measured from one side of the lens to the other, horizontally, at the widest points. The bridge size is the distance between the lenses at the closest point. The temple size is measured from the tip to the hinge, including the bend. 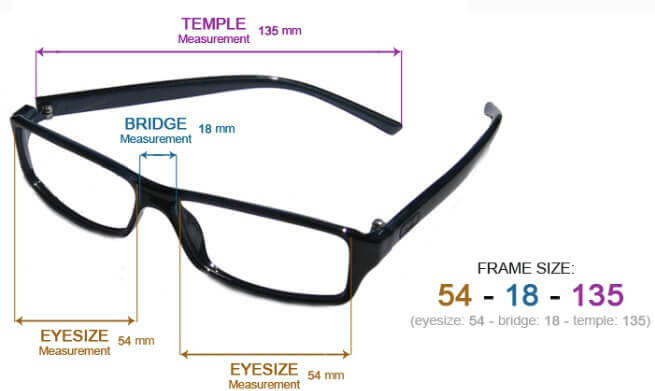 Eyeglasses frames have four basic measurements: the eye, bridge, temple, and B measurements. The eye size refers to the horizontal width in millimeters of one of the frames lenses. The measurement is taken from the inside of one side of the frame to the inside of the other side of the frame. The lens is measured from its furthest point, where it would intersect with a vertical line. The bridge measurement is the distance in millimeters between the two lenses. It is measured between the two closest points of the two lenses. The temple length is measured along the length of the temple, from one end to the other, including the bend. Many frames are constructed with an endpiece that extends from the frame front back along the line of the temple. This backward extension of the frames endpiece could be as little as 2mm, or as much as 15mm. When the endpiece extends further back, the temple length tends to be smaller to compensate. As a result, if you are accustomed to a 145mm temple length, a 135mm temple could work perfectly for you if your new frame has an endpiece that extends back 10mm. This is also the case with many sunglasses with a wrap design. The wrap has the effect of bringing the frame front back towards the ears, thereby requiring shorter temples lengths to compensate. The B measurement refers to the vertical height of an eyeglasses lens, and is measured from the tip to the bottom of the lens aperture of the frame. The measurements are taken from a horizontal line intersecting with the top of the lens, to the horizontal line intersecting with the bottom edge of the lens. The B measurement is only important when making progressive or multifocal lenses. Most glasses frames have some size information printed on the inside of the frame, although the lettering can be worn away with use. To find all the lettering, you must look on the inside of both temples, and on the inside of the bridge. The numbers usually look something like this: GU125 635 50 17 135 For this frame, it means that the model number is GU125, color number 635, with size 50-17-135. 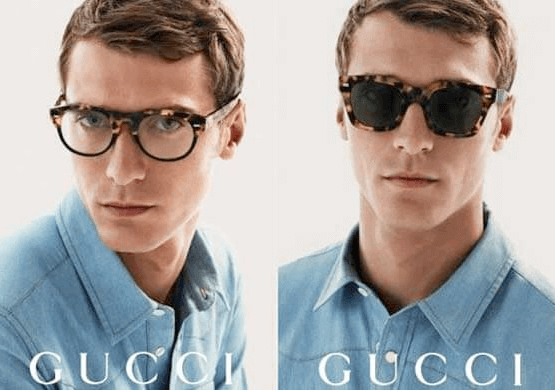 In this case, the brand Guess is abbreviated GU, followed by the model number of the frame. The eye size is followed by bridge size, sometimes with a small square box in between. The temple length could be printed after the eye and bridge sizes, or elsewhere. Other letters and numbers could refer to the color of the frame. The B measurement is never written on the frame. Eyeglasses.com pioneered the Virtual Try On VTO system for eyewear on the internet with two patents issued in 2003. You can the VTO system on this website by looking for the VTO Icon. About half of the frames in our catalog have VTO images, and you can try those on by going to the product detail page. There is a model wearing the glasses, but through the application on that page you can upload your own photo - so easy! You may feel that it is necessary to try on glasses before you buy them. However, unlike a shirt that you cannot alter to fit your body, glasses can be adjusted to fit your face. Read more about eyeglasses fit. We have a liberal return policy, so feel free to order some eyeglasses online, and then return the ones that you don’t like within thirty days for a full refund (there are some limits here). We do not charge a restocking fee unless you want to order a large number of frames on approval. If you are unsure of a color, or which size of a frame to order, this is a great way to be sure and to see the frames on your face in your own home and take your own time to decide. The great feature about this system is that after you input your pupillary distance measurement, the system shows you an accurate representation of the size of the eyeglasses frames on your own face. Unlike a shirt that you cannot alter to fit your body, glasses can be adjusted to fit your face. We group glasses frames into three basic frame types: full frame, half-rimless frame, and rimless frame. A full glasses frame has a rim that completely encircles the lens. In a half-rimless glasses frame there is no rim on the bottom or top of the lens. Most half-rimless frame styles have the frame on the top of the lens, but some half frames have the rim on the bottom. Half-rimless glasses frames that are rimless on top are usually for reading, and they are called half-eye frames (the lens sits low on your nose and the top of the lens is flat, so it looks like half a lens). Rimless eyeglasses frames have no frame at all around the lens. Rimless eyeglasses come in three pieces (two temples and the nose part). The lenses are actually part of the structure of the frame, so it is important to only use high index, polycarbonate or Trivex lens material on rimless glasses. Mounting lenses into rimless eyeglass frames is tricky and requires a skilled and experienced technician. Each lens must be drilled perfectly so that the frame fits snugly into the lens. Poorly mounted rimless glasses frames will begin to rattle, and can eventually crack the lens. One advantage of buying rimless glasses frames online at Eyeglasses.com is that our labs produce very high quality rimless mountings. A half-rimless eyeglasses frame design has a rim over the top half of the lens (and sometimes just on the bottom half). In most cases the bottom part of the lens is held in place by a nylon cord, but some frames are drill mounted so the cord is not necessary. The frame on a half-rimless frame is most commonly on the top of the lens, although occasionally it is located on the bottom of the lens. This is a generic term that refers to eyeglasses frames that hold lenses that are used only for reading (near vision). A reading lens simply magnifies objects that are close to us, like the letters in a book. Your eye doctor can determine the magnification power that is best for you, or you can figure it out by yourself through trial and error. Once you know your power, it is easy to shop for reading glasses frames online. Follow this link to read more about reading glasses. A doctors prescription is not required in order to select a reading lens. Drugstore reading glasses are simply glasses frames with lenses pre-loaded in a range of magnification powers. It is usually less expensive to purchase reading glasses frames this way, but stock lens powers may not provide a perfect vision correction. For best results, reading lenses with magnification customized to your needs can be installed in any pair of glasses frames or rx-able sun glasses frames. You can also make your own sun-readers for reading at the beach just by adding tint to the lens. Reading glasses are becoming very fashionable, and many designer glasses frames are now made as reading glasses. Or, you can customize a pair of regular prescription designer eyeglasses frames just by adding reading lenses to them. The phrase “computer glasses” refers to any pair of eyeglass frames with lenses that have a focal length set at arms length, and with anti-reflective (AR) coating. The wearer needs to measure the average distance from his/her face to the computer screen, and give that measurement to the eye doctor. The eye doctor will then prescribe an intermediate (arms-length) prescription power to be used in the lenses. The anti-reflective coating helps to reduce the glare that may come off of the computer screen. There are thousands of subtle differences among eye glasses frame shapes and eyeglasses frame sizes. The shape and size of the eye glasses frame usually depends on your choice, based on what you think looks good on your face. Only in a few cases does the prescription restrict the shape and size of an eyeglass frame. Whether an eyeglass frame is basically rectangular or oval is in the eye of the beholder. 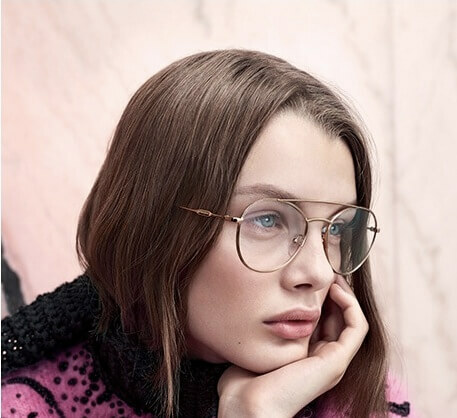 There are thousands of gradations and subtleties, and in the end it really doesn’t matter what you call an eyeglasses frame’s shape, what is important is whether you like it on your face or not. Rectangular frames are somewhat squared off in their appearance. Modified rectangles are rectangles with softened corners. Oval frames have curves rather than lines in the outline. Most designer eyeglass frames have either round or oval shapes. One of the most classic (but hard to find) frame shapes is the round eyeglasses frame. Round frames are perfectly round. We have created our own line of round titanium eyeglass frames, using German spring hinges, that is a terrific value considering the high quality of the frame. The “panto” or "P3" frame shape gets its name from the eyewear manufacturers, and it refers to a classic style that falls between oval and round. The top of the frame is round and flattish, and the bottom of the frame is round but slightly pointed. The Aviator frame shape is named after WWII aviators who wore eye glasses frames with a distinctive shape. Each eye has a tear drop shape, with a diagonal cut from the nose down to the cheeks. Cat eye frames are slightly pointed at the sides by the ears. The eye glasses frame is elongated. They were very popular in the 1950s and 1960s. Half-Eye frames are designed to sit lower on the wearer’s nose, allowing the wearer to look over the top of the lens easily. Half eye eyeglasses frames are designed to be used as reading glasses. Facial coloring and face shape are two important factors to consider when choosing appropriate eyeglasses frames. 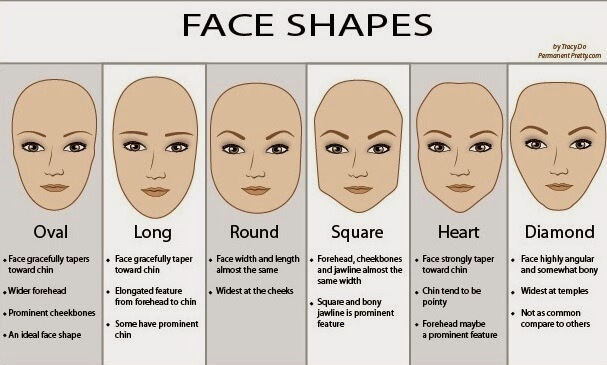 The first step is to determine your face shape (oval, round, rectangular, etc). Frame shapes can be used to accentuate or de-accentuate your facial features, depending on how you choose to express your personality. For example, if your face is basically round, round glasses would reinforce that look, and rectangular glasses would reduce the roundness of your face. Frame coloring works the same way; you choose the frame color to either match or contrast with skin and hair tone, eye color, jewelry, and clothing colors. The degree to which you match or contrast will contribute to the expression of your personality and your look. The shape of your eyeglasses can complement the shape of your face. To understand how eyeglasses shapes can affect your face, begin by understanding the fundamentals of face shape and proportion - the first step in selecting glasses that help you look your best. You can use our patented Virtual Try On application to see how an eyeglass frame looks on your own face. Just upload your photo and input your pupillary distance measurement. While most faces are a combination of shapes and angles, there are six basic face shapes. Below are descriptions of these face shapes and guidelines for which types of glasses frames work for each. A round face shape has curvalinear lines with the width and length in the same proportions and no angles. Your goal is to make the face appear longer and thinner. Look for angular, narrow glasses frames that will lengthen the face; high or mid-height temples, which help create a longer profile; a clear bridge that widens the eyes; colored temples to add width; and glasses frames that are wider than they are deep, such as an octagonal shape. A square face shape is characterized by a strong jaw line and a broad forehead - the face width and length are in the same proportions. Your goal should be to make the face look longer and soften the angles. Look for curvilinear, narrow style glasses that soften facial angles; glasses frames that are wider than the widest part of the face;? eyeglasses that have more width than depth; narrow oval glasses are an excellent choice. The oval face shape is considered to be the ideal shape because of its balanced proportions. The oval face is neither curvalinear nor angular. Your goal should be to keep the oval's natural balance. Look for glasses frames that are as wide as, or wider than, the broadest part of the face. Look for almond or walnut-shaped glasses frames that are neither too deep nor too narrow so that they do not upset facial balance. The oblong face shape is longer than it is wide and is characterized by a long, straight cheek line and sometimes a longer nose Your goal should be to make the face appear shorter and more balanced. Look for glasses frames that have top-to-bottom depth such as rounder panto or P-3 shapes; decorative or contrasting temples that can add width to the face; a low bridge to shorten the nose. Diamond-shaped faces are narrow at the eyeline and the jawline - cheekbones are frequently high and dramatic. The diamond is the rarest face shape. Your goal should be to highlight the eyes and bring out the cheekbones. Look for glasses frames that have detailing or distinctive browlines. Rimless frames, ovals or cat-eyes are all excellent choices. The base-up triangle face shape has a very wide top third and small bottom third. Your goal should be to minimize the width of the top half of the face. Look for glasses frames that are wider at the bottom half of the frame. Very light colored and materials are effective, and rimless styles are an excellent choice. When considering different eyeglasses fashions, there are a number of factors you should take into consideration. First, the design of a frame can vary greatly, from vintage to modern, to classical and sporty styles. Next, you should consider that frames can come in different materials including metal, titanium, acetate, plastic, wood, and mixes of these products. Furthermore colors vary from brand to brand, having options such as pink, yellow and red. This trend has been popular in the media lately, but we see that trend waning as too many people looking for new fashions have gone there, and are now beginning to swing back to something more edgy. For edgy, we are seeing more interest in Lucky Brand for the ladies and and John Varvatos for the men. Solid colors used to dominate the scene, but now the trend is for more complicated layered colors like you might see in this collection. Also, Lafont is coming back due to their beautiful coloring and chic-retro styling which is a good bridge from the retro to the modern Parisian style. Check out Prada, Dolce & Gabbana, and Converse to see many styles with this layering. Ladies are looking more and more for small frames, frames with eye sizes below 46 (which you can find using our frame search or advanced search functions). Small frames really only work on small head though: if you have a larger head, this style is not for you. The sheer and sleek look of the rimless styles continue to generate excitement, for example Silhouette, but more attention is being made to the temples of the rimless frames which are not just small silver titanium strips anymore. Look for hi tech plastics, plastics with a metal spine, and larger thicker temples made of plastic with the full variety of colors. 1) Warm soapy water. Hold the frames under a faucet of warm water. Get your fingers soapy and GENTLY rub the lenses and the frame. This will remove grease and dirt without scratching the lenses. 2) Lens Cleaner. You can use lens cleaner from a small spray bottle if it is more convenient, but we prefer the water method if at all possible. 3) Gently Dab Dry. The biggest mistake people make is to rub too hard. Rubbing hard, especially on a dry lens, is where most of the scratches come from. Gently dab the cloth on the lens until it is dry. 4) Use a Soft Cloth. The best cloth to use is a microfiber cloth, followed by a clean cotton cloth, followed by a tissue or toilet paper, followed by paper towels, followed by sandpaper (just kidding). If your cloth is not soft, the lenses will scratch. If your cloth is not clean, the lenses will scratch. 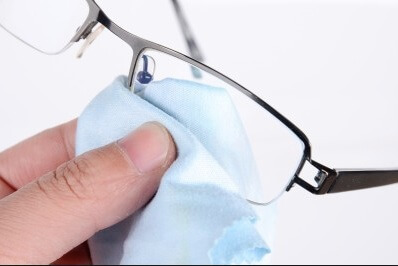 Cleaning eyeglass frames is also best done with soapy warm water. If you clean just the lenses, the dirt and facial oils from the frame will eventually find their way to the lenses. You can also take your prescription glasses to a local optical store, which has a machine for cleaning eyeglass frames. However, if your frame has any inlaid gems, you should not have them cleaned by machine, only by hand. Step 1: Get your prescription. Step 2: Choose your eyeglasses frame. Step 3: Choose the lens material. Your prescription will determine the best lens material for your needs. You can upload your prescription to this website, email it, fax it, call it in, or mail it to us - choose the method that works best for you. You can choose a frame from our catalog, or you can mail-in a frame and we will install replacement eyeglass lenses. If your eyeglass frame is “rimless”, you cannot use CR39 lens material, and there are additional mounting costs. If you have a mild prescription, you do not need to pay extra for “thin” lenses. Step 4: Choose your lens. We offer a “good, better, best” selection of lenses in each category. As you go up in price, you will get better quality lenses with better vision. We include an anti-scratch coating on all lenses for FREE. Our high-index lenses include UV protection FREE. Other options can be added. Add your lenses to the shopping cart, and then checkout. If you own a pair of glasses frames that just need to have the lenses replaced, we can help you. Having to replace an entire pair of glasses or sunglasses because of a broken, cracked, or scratched lens is expensive when you consider the price of new frames with the cost of new lenses. If you have a pair of perfectly good frames, pair of favorite frames, or have just bought a pair of vintage frames and need only new lenses, save some money by getting replacement lenses. There are a few steps that need to be followed when buying replacement lenses. First you need to have a prescription for the replacement lenses or we will duplicate your prescription from the glasses you send us. If you are changing prescriptions or have an eyewear frame with an old prescription, we will need your new prescription information, as well as your “PD” Pupillary Distance measurement. You can request the pupillary distance measurement when you go to your optometrist for an eye exam or if you have an optician where you have had other lenses fitted for glasses frames, they may have your PD record. Request it from them. Since you already have your eyeglass frames which are either full rim, half rim or rimless, the next step in getting replacement lenses is choosing the lens type, single vision, bifocal, trifocal, or progressive along with the type of material you want your replacement lenses to be made from: plastic, polycarbonate, hi-index, or glass. It is important to understand the advantages and disadvantages of each, so that you can find the perfect replacement lenses for your needs.